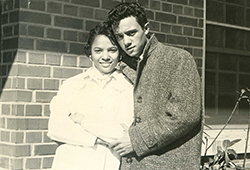 Their lives togetherand their life's workbegan on the campus of NCCU. From there, Dr. S. Dallas Simmons '62 and his wife, Yvonne '62 journeyed to the pinnacle of higher education administration, with North Carolina Central University always close to their hearts. They met in 1958 as fellow students in the business program, married a year after graduation and took their first jobs on campus: Dallas as manager of data processing and Yvonne as secretary to the dean of the undergraduate school. They relocated to similar positions at Norfolk State University, but returned to NCCU in 1967. Dallas taught as he earned his master's degree in business and Yvonne supported their growing family. In 1971, Dallas was hired as assistant to the chancellor, allowing Yvonne to choose a more flexible teaching career at Durham Technical Institute while earning her master's degree in business from NCCU. For his work with the chancellor, Dallas received a Government Service Fellowship from the State of North Carolina to pursue his Ph.D. in education administration at Duke University. He was promoted to vice chancellor for university relations at NCCU, and in 1981 was appointed president of Saint Paul's College in Lawrenceville, Va. Four years later, he accepted the presidency of Richmond's Virginia Union University, a position he held from 1985 to 1999. In appreciation for their alma mater and the mentorship he, his wife and eventually, their son, received at NCCU, Dallas bequeathed $250,000 to the university through a life insurance policy creating The Simmons Endowed Scholarship after his death. Established in the names of Yvonne Martin, S. Dallas Simmons and S. Dallas Simmons Jr. to support a business major in financial need, the scholarship funds in perpetuity a student, "who is willing to work hard, is involved in campus and community activities and exhibits leadership qualities." A bequest is a gift from your estatea transfer of cash, securities or other property made through your estate plans. You can make a bequest to North Carolina Central University by including language in your will or living trust, or by designating NCCU as a beneficiary of a life insurance policy or retirement account. A bequest costs nothing now, yet gives you the satisfaction of knowing you have provided for North Carolina Central University in the future. Gifts from your estate to North Carolina Central University are exempt from federal estate taxes. If you let North Carolina Central University know of your plans, we will be able to thank you now and recognize you as a member of our Chautauqua Heritage Society.